This week, it emerged that the giant azhdarchid Quetzalcoatlus was an atrophied, under muscled animal that was weak and inefficient at takeoff, and could only launch through use of running bipedally with flapping wings, headwinds and downward sloping ground. The newly proposed idea of quadrupedal launch, where pterosaurs became airborne via powerful leaping with all four limbs (Habib 2008) is hokum, being the stuff of fantasy and overly zealous application of bat launch strategies to flying reptiles. 70 kg is the maximum mass that these giants and all other flying animals could achieve, and recent discussions that they were considerably more massive (Paul 2002; Witton 2008; Henderson 2010; Witton and Habib 2010) are plain wrong. Chatterjee et al.’s abstract and press release do not explain why the many arguments supporting pterosaur quad launch (see here and here, for a start) are problematic or why arguments and methodologies to estimate relatively high masses for pterosaurs (here) are incorrect. Instead, they’ve decided that such scientific rigour doesn’t matter, and gone straight into informing the public that giant pterosaurs took flight in the way described in their presentation, and that all other opinions on the matter are wrong. By bigging up their abstract rather than a peer-reviewed publication in which their methodological details and discussion are explained in detail, Chatterjee et al. have given the impression that their work is more scientifically credible than it actually is. Science journalists have lapped the release up, presumably because giant pterosaurs are cool, but they have not mentioned the lack of a detailed peer-reviewed study behind the findings, nor (in the majority of cases) bothered to find out what other palaeontologists make of the story. This is not the first time this sort of outreach has happened. The proceedings of other conferences and un-reviewed articles have given us infamous press stories such as the ‘Triassic kraken’, vampire pterosaurs, and the suggestion that all dinosaurs were aquatic. And these are just examples from recent memory. As a scientist concerned about effective and accurate scientific outreach, I find this sort of journalism very worrying. I have no problem with off-kilter ideas like those proposed by Chatterjee et al., but their desire for press attention without applying appropriate scientific rigour is extremely concerning. They have not documented their studies in a scientific paper, sought the opinions of other experts in peer review to construct a scientifically sound hypothesis and news piece. Instead, they went straight from the ‘idea’ phase of their project to media broadcasting, which, as I see it, has three effects. Firstly, it risks misleading the public if their ideas fail to meet scientific scrutiny (most of the ideas mentioned thus far in this article are guilty of this, and I strongly suspect the same is true of the Chatterjee et al. story). Secondly, it undermines the integrity of the scientists behind the story. The idea that “any publicity is good publicity” does not apply to scientists. Within academic circles, you become “the guy who went public with [crazy idea]”, which doesn’t do your reputation, or that of your institution, any favours. Thirdly and perhaps most importantly, such practises undermine science generally. It’s no wonder that palaeontology is often viewed as a speculative and unsubstantiated discipline when a lot of our press work concerns unsubstantiated, often ‘fringe’ or highly controversial ideas being presented as credible hypotheses. This only creates confusion among people as to what the leading hypotheses on given topics are or, when press stories have gaping holes in logic (e.g. the Triassic kraken, aquatic dinosaurs) show scientists as bumbling, foolish individuals incapable of using common sense. This is a serious problem which we, as scientists and scientific communicators, need to address. Many people are generally sceptical of scientists and their conclusions, concocting up ideas of scientists in scaremongering conspiracies for grant money, or seeking media attention to justify their employment at publically funded museums and universities. The manner in which scientists frequently present unsubstantiated work to non-academics does little to help restore our reputation with these individuals. While it’s of fairly trivial concern whether the public, or anyone for that matter, knows the ins-and-outs of pterosaur launch, all scientists need to think about the broad perception of science by the public. Scientists researching our many severe, modern crises need to be taken seriously, and press reports that expose incomplete or shoddy scientific work negatively impact this perception. Fairly or not, many people, tar all scientists with the same brush (for proof, check out the comments section on any science story publicised by the Daily Mail). We should be working to enhance the reputation of science among the public so that scientific opinions on critical issues like our on-going losses of biodiversity, climate change, sustainability of our lifestyles, energy conservation, and other real, genuine problems are trusted and taken seriously. Scientists leaping for the press with hypotheses that have yet to be suitably tested only present scientists as attention seekers, incompetent or both, and we cannot afford to perpetuate this idea further. Of course, the fault does not only lay with the scientists. Science journalists also need to raise their game, becoming more circumspect when following and writing up of press stories, noting the state of the research involved, gauging its context within its field and, perhaps in some cases, ignoring clearly bogus, fringe reports entirely. I have worked with a great number of people involved in the scientific media who clearly do not have any interest in science beyond their job, and these are the worst people to be trying to turn the sometimes complex hypotheses of scientists into digestible material for laymen. As Brian Switek shows on a daily basis at Dinosaur Tracking, you become an exemplar science journalist not by just being a deft writer, but you have to give a crap about science too. Failure to fact check and presenting ideas inaccurately is miscommunication, which is clearly an enormous failing for an individual employed to dissemination of information. In short, we need to stop thinking about scientific outreach as purely an exercise in getting the most attention possible to our research or science news articles. These short-term goals are damaging to science as a whole, which is what science communicators are meant to promote. Science communication is an opportunity to educate non-academics with new and exciting results of good scientific practise that have helped develop our understanding of the world and our place within it. We should take the responsibility that this task requires fully and seriously if we want our scientific voice to be listened to. Chatterjee, S. and Templin, R. J. 2004. 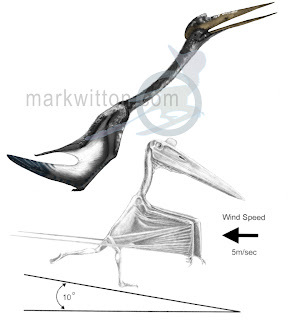 Posture, Locomotion and Palaeoecology of Pterosaurs. Geological Society of America Special Publication, 376, 1-64. Habib, M.B. 2008. Comparative evidence for quadrupedal launch in pterosaurs. Zitteliana, B28, 161-168. Henderson, D. M. 2010. Pterosaur body mass estimates from three-dimensional mathematical slicing. Journal of Vertebrate Paleontology, 30, 768-785. Paul, G. S. 2002. Dinosaurs of the Air: The Evolution and Loss of Flight in Dinosaurs and Birds. John Hopkins University Press, Baltimore, 472 pp. Witton, M. P. 2008. A new approach to determining pterosaur body mass and its implications for pterosaur flight. Zitteliana, B28, 143-159. Incompetent journalism is in every field unfortunately. Something flashy, preferably that disproves something well constructed is to the media like a baby dinosaur is to a giant azhdarchid. "It pushed the very boundaries of size to the brink and is considered the largest flying animal yet to be discovered." I'm either reading it wrong or "the largest flying animal yet to be discovered" doesn't make the least of sense. I was starting to wonder if this blog had been forgotten about. Nice to see this update. Henrique: Yes, that is mighty confusing. Perhaps we'll agree on a launch strategy once they discovery it? Mr. Adequate: Unfortunately, the Pterosaur.Net team have all coincided being rather busy this year. We've never forgotten about the blog, but we've struggled to find the time to write articles worth reading at the moment. I have a lot of half-finished pieces which I intend to get back to one day. In the mean time, there are plans to breathe new life into the blog, so updates may start to appear more regularly soon. We hadn't forgotten, but several of us have been super-busy recently (Darren, Mike and I have all had new jobs) and actually there's not been much happening in the world of pterosaurs of late. The next Flugsaurier volume will (or should) be out at the end of the year, so expect a bit of a glut then. In further news, Brian Switek has picked up this story, with some sharp comments on science journalism, at Laelaps. This is such a festival of stupiditude that it makes me want to bury my head in soft peat and recycle it is firelighters. Thank you, Mark, for bringing such an emphatic (if polite) smackdown. Mike, distressing as all of this is, I now consider it all worthwhile because it has brought the 'festival of stupiditude' to my consciousness, for which I am eternally grateful.